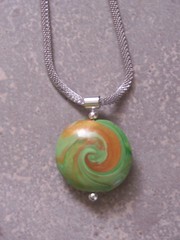 Home / Craft Product Reviews / Beads/Jewelry Products / Naftaliâ€™s EZ Bead Changer Necklace- Fabulous! Naftaliâ€™s EZ Bead Changer Necklace- Fabulous! I was surfing through some Etsy Polymer Clay artists’ sites, and I ran across a jewelry maker who goes by the name of Naftali. 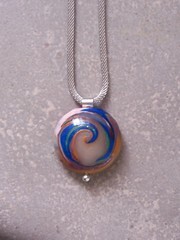 In addition to some lovely polymer clay beads and jewelry, she also sells these EZ Bead Changer necklaces. I bought one on Monday, and I was delighted to receive it on Friday afternoon. It came in a little organza pouch with a couple of Tootsie Rolls, and in box with ribbon. Nice presentation.Â I got the sterling silver version, which also came with a wire mesh necklace. It was $37.00 plus the shipping, but it came in under $40.00 all told. There is a little bead “nut” at the bottom of the changer, and it just slides on and off of the post- kinda like one of those earwire nut thingies.Â I immediately raided my “orphan” bead box for some ofÂ those big wonkin’ beads that I made, but just couldn’t figure out what to do with. HA! At least 5 of them will be AWESOME on this necklace! The mesh necklace part is about 3/8 inch wide, so it’s nice and substantial… and balances out the big wonkin’ beads! I immediately took it over to Eva at GRB, and she loved it, too! We’re going to offer a class around these, and we’ll have a great time making….wait for it……BIG WONKIN’ BEADS! Hi Jenny! These are really cute!! Thats a cool idea! Does the ‘nut’ thread on slide on? Does the weight of the bead make a difference?